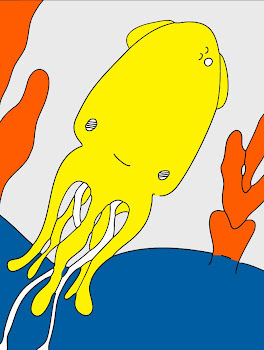 Technicolor Squid: Oh Yes. There Have Been Many Projects This Month. Oh Yes. There Have Been Many Projects This Month. Have I shared them with my favorite lovelies yet? No. I am a naughty naughty blogger. I will try to add a few of them to the monthly update. In the meantime, I apologize. I am sharing this with you though. You may or may not remember my painting for my grandfather last year. Well, this is technically it's companion piece as it is a birthday painting for my grandmother. They are similar in their sparse design, but not in their themes. You may feel free to laugh at it heartily. All I ask is that you try not to laugh so so loudly that I can hear you all the way over here in Washington. Thank you lovelies. Hugs. xox=vv. christine - i LOVE it. really. thank you for the v-day card and my very own stickers... dare i give them to people? i love this! it is gorgeous. just gorgeous. I LOVE it, I think it's really beautiful. No laughing here!! Yes show us more, more! Oh my god Christine, that is utterly utterly beautiful! Times like this I get frustrated that I'm not a wordy person as I would love to express how totally gorgeous and wonderful I think it is, but all I can do is use the same old words I use when I get a nice piece of cake. This painting is so much more beautiful than cake. What size is it? Tiny and cute, big and bold, medium and marvelous? of course I remember your painting for yor Granfather, it's the one with the adorable wheel barrel? Thanks for your sweet comments the other day miss! I'm so happy to see you're coloring books are doing so well!!!! I love it. 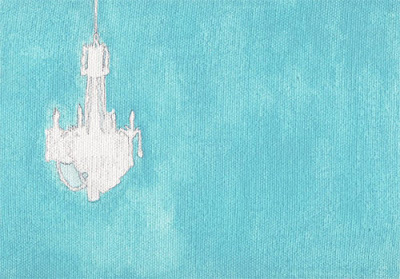 I have a thing for pictures and paintings of chandeliers for some reason.